Learn how to make Punjabi Chhole. This is one of the best Indian food. It can be served for dinner. 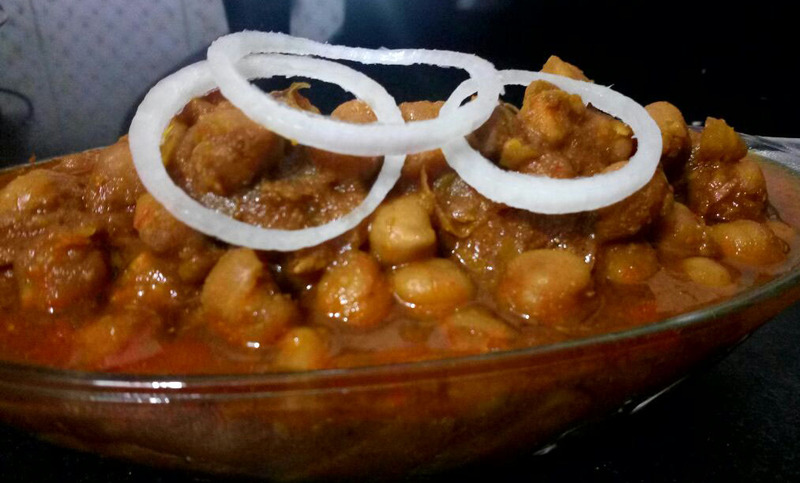 A home made the recipe of Punjabi chhole is here. It can be served with bhature - a big size puri or paratha also. Pressure cook Kabuli chana - white chickpeas with the tea bag and salt for 3 whistles until they are soft. Discard tea bag. Heat oil in a pan, add the cumin seeds. When seeds crackle, add onion, ginger and garlic. Fry till onion is golden brown. Add chhole masala, red chilly powder, turmeric powder, dry mango powder, coriander powder and cumin seeds powder saute for 1 minute. Add boiled chana and 1 cup water and mix well. Add salt as required. Garnish with onion rings and coriander. Hot and delicious Punjabi chhole is ready to serve. You can serve this with kulcha, naan, paratha, kulcha or bhature. Serve with fried green chilly and sliced onion. Chhole masala is readily available at grocery stores. If you don't want to fry green chilly take them in a small microwave proof bowl and add a pinch of salt and 1/4 teaspoon of oil and cook for 30 seconds. It will give same taste as fried one. Very tasty!! Tried his and I must say, that it is almost divine. I bet yours lacks the "almost" attribute. Well, so much for a bad cook like me! :) Thank you very much for the recipe!